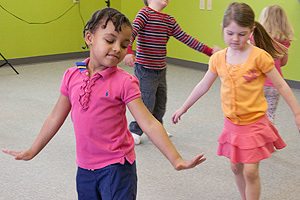 Mistletoe Musikgarten has provided early childhood music and movement in Fort Worth since 1997. We are deeply committed to sharing joyful, active music-making - in baby music classes, toddler music classes, and pre-school and kindergarten music classes with children and adults. 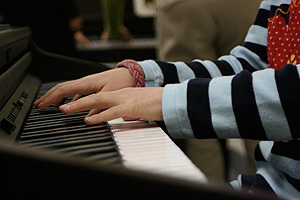 While we nurture music aptitude and develop music literacy, children and parents (and adult piano students) enjoy their musical activities, in class and at home. Research has shown that music aptitude is highest at birth but diminishes if not actively nurtured in young children, so our musical activities intentionally nurture your child's music aptitude. Read What Parents are Saying to find out more. To hear the music and see the joy of music and movement, I invite you to watch a brief movie about Musikgarten right now! Mistletoe Musikgarten, located in central Fort Worth . . . The children at Mistletoe Musikgarten . . . Please sign me up NOW for reminder emails before each semester. OR call NOW to schedule a FREE Preview class. All classes are in central Fort Worth, near the Fort Worth Zoo. If you want reminders about registration and FREE events, sign up for email reminders here. Families with babies, todders, and other very young children are encouraged to connect with Sophie Meintjes, a long-time student of Ms. Carol's who is opening Saplings Musikgarten right here in Fort Worth. We are keeping the Teacher Page of this website updated regularly with Ms. Sophie's information, as her studio grows and blossoms. Tip of the Season: Winter is a time to listen. The trees are bare. Nature's sounds travel far. As you walk with your children, listen for the birds and dogs and leaves, carried on the chilly winds. There is a world out there, waiting to share its beauty in sound. Make listening a family tradition! I look forward to enjoying active music-making with you and your family this summer, fall, winter and spring. After all, music is for all seasons. © 2019 MUSIKGARTEN:: Mistletoe Musikgarten All Rights Reserved.